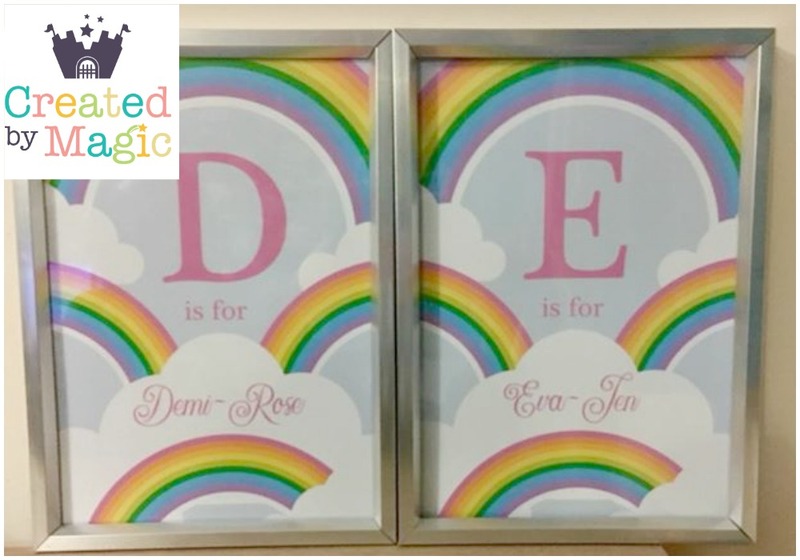 This week we were very lucky to receive and review prints made by Created by magic if you haven't heard of created by magic, let me tell you a bit about them they are a website that specialises in personalised prints and keep safe gifts which are truly beautiful. There are products for all different occasions such as first birthday ideas, christening gifts or gifts just because. I really love personalised items so I loved the idea of these, I chose the bright rainbow prints because I love rainbows there is something really special about a rainbow and as the twins will be my last babies all my children are special but there is something magical about having twins, it seems fitting to pick that particular print for them something they can have upon their wall, once they go into there own bedroom and keep as they grow up. Ordering the print is really simple you just choose the print type you want to purchase, type in the name of your choice then check out - I chose a really simple print but there are other prints in which you can have your child's name and date of birth or you could have a wedding print with all the details of the big day on the print. 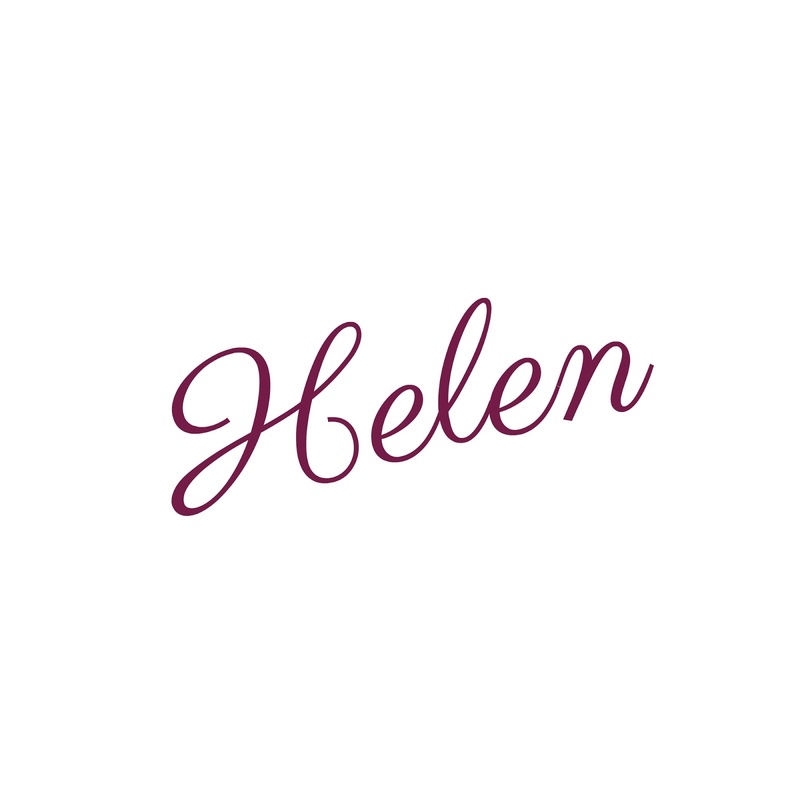 The website itself is really easy to navigate around so ordering prints and other personalised items could not be any more simple. Our prints arrived really quickly from ordering and they came really well packaged, in an envelope with do not bend on them. The prints are really good quality, eye-catching and bright which I love, the pictures are exactly as they are shown on the website - the only downside is they don't come already framed so do check before you purchase especially if you are looking for something that is framed already. Having said that frames don't cost that much and you can pick up some decent frames for your print or prints at pretty good prices not only that if you buy your own frame you can match it to the room or where ever you intend to display it. 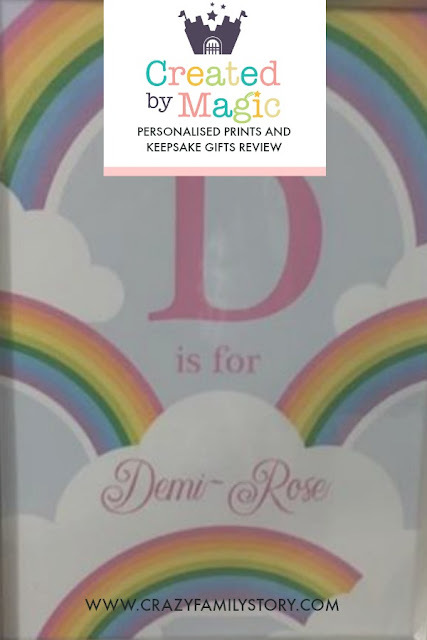 Overall I love Created by magic and was very impressed with the girl's prints, the company is exactly what it says creating a little bit of personalised magic for everyone. The personalised prints are really reasonably priced, the pictures that I ordered are priced at £15.00 each however other personalised items prices vary check out the website below to find out more. There is something for everyone over on their website. The prints would make for a perfect christening, birthday, Christmas or newborn baby present. Or if you are just looking for a beautiful personalised picture for your child’s room. Created by magic have been kind enough to offer you, my readers, the chance to win a personalised print of your own, you can enter the via Rafflecopter below good luck. All other steps in the Rafflecopter form are optional. Ooo definitely the Personalised new home print!! We have just uprooted our family 500 miles due to my husbands job and would love this to make the hall feel more homely!! The wedding venue illustration print, its gorgeous. I love the children's artwork prints! What a fab idea! Personalised Wedding Venue Illustration Print for me please! Love the Peter Rabbit print, they are all wonderful! I would choose the Personalised Peter Rabbit Birth Details Nursery Print for my nephew that's due at New Years Eve! Peter Rabbit nursery print would be great! I would pick out the Personalised Red Fox Nursery Print for my nephew. Personalised Bear Family Print - I love it. As when me and my husband got married we had bear cake toppers, and my daughter's nick name is 'hairy beary' she was a hairy baby. Then we have our youngest of 'baby bear'.